← Words we still use from Shakespeare! It’s the moment that every writer both looks forward to and dreads in equal measure; deciding upon and somehow either creating, commissioning or crossing-your fingers and hoping an inbuilt software template can create a good book cover. Book covers are important because unless you are Stephen King (I’m 50% there as I have the right first name) then many readers will decide solely what book they will buy simply by the look of your book cover. Forget the good reviews on Amazon, if you don’t have a good cover, browsers either online or in store are likely to caryy on looking until they find something more eye-catching. I have tried three different approaches with my book covers and ironically it was the one that I paid for that I have always been least happy with which is why in the summer I am going to rename and re-cover my first novel. For my second book a friend and very talented photographer (Hello Ian) kindly helped design a graphic from a collection of my holiday photos which made for a great front cover and the conveyed the message which I wanted of a pile of holiday photos and the stories behind them. For my third book, as it was only ever going to come out on Kindle and because I had found a very suitable free stock photo I used that and having now gained lots of experience on formatting and the look I wanted, the free template online software worked perfectly. As well as being eye-catching your book cover has to in some way relate the theme of your book. It’s very tempting if your book takes places in various locations and even different times that you want to highlight as many of these on your front cover. However, it’s really important that you don’t do this. Pick a single theme and either design a cover around it or pay someone more artistic to do it for you remembering to pick a suitable font and spine colouring if you aren’t going to wrap-around a photo. I’m at the stage where I have finished my WW1 brief history book. It took me about 6 weeks of writing and making sure my memories matched my research. I’ve got a number of maps and photos I’d like to include as well as some poems and it has taken some time to check the copyright of these and formatting them so they work ok in a Kindle and paperback format will no doubt be challenging. Back to book covers though. Normally factual books choose to go with either paintings, drawings or photography which makes working on a book cover slightly different from fictional books. My choice of cover has to relate a dependable and serious book but one that is accessible to people who know little about WW1 and definitely don’t want to get bogged down in some huge and heavy history book. Though I did consider a book cover featuring poppies, it didn’t seem quite right as that to me makes it feel like a biography or a distance between then and now. The other possibility included a combination of maps and flags but I thought that would be too off-putting to my potential readers. What I want is some simple and eye-catching that sums up the war quickly and for that I decided to go with one or more photos. Though the war and my book covers everywhere from New Zealand to Mexico it is clear that what most people think of when it comes to WW1 is the Western Front. but there were two that almost immediately became my must-haves. Obviously there are countless thousands of black and white photos but two of them in particular immediately grabbed my imagination. This photo is of a group of Australian photos walking on duck boards. Their reflections are shown in one of the large puddles or crater holes whilst their silhouettes stand out against the sky. If you look closely you can see observation balloons in the sky. Everything is grey and evocative of the misery that this war caused. Many though not all photos from WW1 are now public domain whilst others have clauses as to what you can use them for. I sent a couple of emails to the Australian War Memorial and they very kindly allowed me to use this on the cover for my book. Royal Irish Rifles seconds before The Somme. The photo above is one that I have looked at on and off for the last few decades and as soon as I realised I would need a photo, this one came to mind. 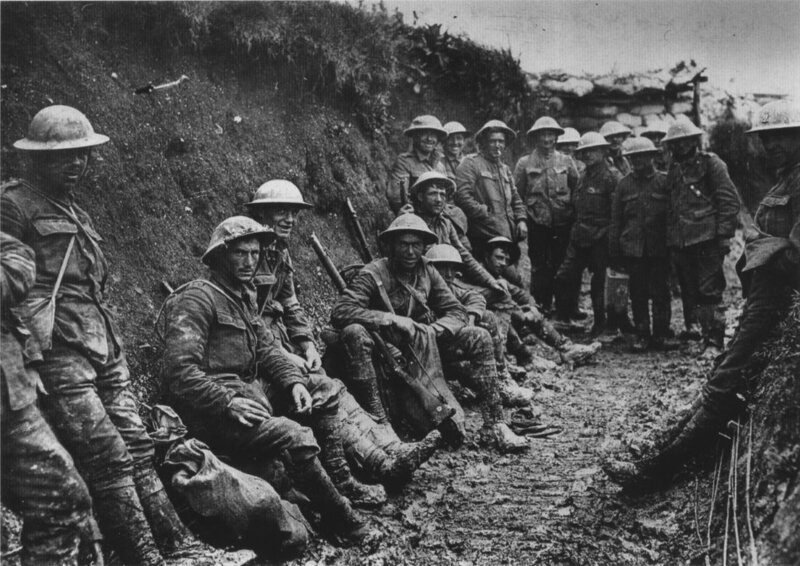 It is of soldiers of the Royal Irish Rifles at about 7.25am on the morning of 1st July 1916. It is taken just moments before the commencement of The Battle of The Somme, perhaps the bloodiest British battle of all time and one of the very worst in history. The reason I like this photo is that is of a very famous event and its hard to imagine that just 10 minutes after this photo was taken it is likely that many of these men were dead. I went to the very spot where this photo was taken and it was a very moving moment. According to Wikipedia, this photo is also Public Domain and it is mentioned elsewhere that it is public domain however on visiting the Imperial War Museum Website it states that it is licensed by Getty Images and to use it would cost me hundreds if not thousands of pounds. Not only is this confusing but I find it hugely wrong that you should have to pay such a huge amount of money for what is in many ways an educational book. I’m pretty certain that none of the men pictured in the photo would want to see may pay such hundreds or thousands of pounds. I’ve read in places that public domain photos can be used free of charge whatever companies like Getty say if you are fine with using a lower resolution image as I am but I will have to look into it more unless one of my readers understands copyright law better than I do! Both are great photos and ideally I would like to use one on the front cover and one on the back cover. If you have a favourite let me know below! 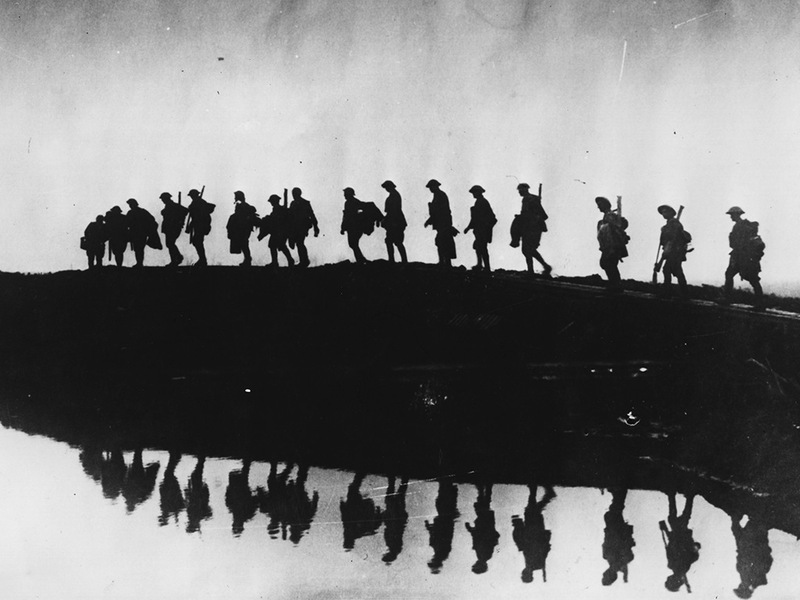 This entry was posted in Life, writing and tagged Australian War Memorial, Book Covers, Getty Images, history, Imperial War Museum, Life, Publishing, Self-Publishing, The Somme, writing, WW1. Bookmark the permalink. I too have always liked the second photo – it came up many times in my history lessons! But for a front cover I prefer the first one, I can even see a title forming across the top. A good front cover does indeed make such a difference – I remember when I was younger, browsing the library and picking out books based on weather the cover caught my eye…I’ll admit I still do that a bit now! Thank-you. Yes a title in the sky would look great. It’s such an eye-catching photo. I used to do the same, it’s rather like going to see a film at the cinema just because the poster or trailer looks better than the rest. I like the first photo, because the soldiers are faceless. I feel that’s how leaders of the time must have felt about their men, to have sent hundreds of thousands of them charging at enemy machine guns. If your book were about a specific unit, then of course it would be great to see photos of the soldiers, but for a general history, I like the more abstract photo. That’s a really good insight for this photo. I feel the same way about it too. As the book is about the war as a whole and not a specific unit or even country this one seems suitably abstract and foreboding. Thanks for commenting. That’s 2 out of 2 for the same photo. I also love the first one. It’s very dramatic, timeless and eye-catching. And having just spent the last couple of weeks trying to get a cover for my own book designed, I feel your pain. I chose to hire a designer, but after about 15 covers – all of which I was very unhappy with – I changed designers and found one who actually “got” what I was after! She came up with one design – with some differing colour options – and we were in business! It’s quite nerve-wracking, so I wish you well in your final choice. Oh my word, 15 covers! I must admit for my first novel I gave up after 4 or 5 and as there weren’t many on the internet then I made do as best as I could. I’d expect a book cover to be pretty much finalised after a handful of revisions at most. I am working on my novel to turn it into two or three books and am hoping to get a theme for the cover but I’m not sure I could cope with a potential 45 covers!! I have just this minute chatted online with a representative of Getty Images and the photo of the soldiers in the lane though Public Domain still requires an expensive fee for books so it is looking like photo 1 which seems to be the most popular one in any case! Thank you! I admit that several were different colour versions of the same thing…but still, it was a nightmare. Now my book is at the printer, I can relax a bit – until the marketing/selling phase starts at least! They’re both good covers – but somehow neither of them strike me as book covers….I’d like to see something that was a bit more like artwork. Sorry, I meant ‘good photos’ in that first sentence! I like the first one, too, and I like the idea of the title in the sky. Copyright law is so confusing. My books have all been done through academic presses. I picked the paintings/prints for the NYU Press books, but I didn’t actually design the covers. The in-house departments designed all the covers for the reference books. I did have to choose photos for the forthcoming Cultural Encyclopedia of the Breast, and I tried to find as many copyright free images. Some places, like museums, will drop or reduce fees in exchange for a copy of the book–and of course, photo credit. Sometimes fees are based on print run and use. Something labeled “public domain” can often be used in a non-commercial venture, such as a blog, or for educational purposed but not in a commercial book. It’s very confusing. The Library of Congress has many images that are copyright free. I don’t know about WWI images, since I’ve never looked for them. For the UK, have you tried the Wellcome Images? Again, I don’t know about WWI, but I believe they have copyright free or low cost images. Thanks so much for you comments which are obviously from experience! Yes the museum in Australia was very helpful and were pretty much telling me how to avoid various fees. It is confusing though and maybe there should be more clarity to the differences of Public Domain that can be freely used for any purpose and Public Domain that deep down is nominally owned by someone that expects payment for serious use of the image. I just heard that Getty Images need a payment for photo 2. I will look into Wllcome Images, I have about 10 that I would like to include in my book and I can see I will have to thoroughly investigate which ones are free to use. I just saw this article on Facebook. I don’t know if you would want to use any of these images, but I thought you might be interested in seeing them. Both are excellent images. The second photo grabbed me .I will not forget the expressions and fatigue…the dire situation…a couple are even managing a brave smile. The one fellow, turned and facing the camera, eyes directed at the viewer…I won’t forget him..or the others. Yes, their expressions are very interesting and haunting. The chap who is the second face from the left looks absolutely battle-hardened and tired out but also like he is ready for the hell he is going to face. I wonder how many of them survived the first day at the Somme. Yes, he is the fellow that got to me first. I tried to enlist my art student nephew to create the cover for my sci-fi novel. I offered financial and other incentives, but he kept procrastinating. So, I created the cover myself. That was a huge mistake because… I AM DEFINITELY NOT AN ARTIST! Oh well, c’est la vie! Me neither. Graphic design I am ok with but drawing or painting reveals my talents haven’t progressed since I was about six years of age! I do like the first photo but it reminds me of the cover of the Viet Nam novel: The Things They Carried. It does look very similar. I wonder if the Viet Nam novel was the inspiration for the movie poster for Platoon which featured almost a silhouette of men against the jungle. For a cover I prefer the first photo. It would be nice if you could use the second photo but somewhere inside your book. There’s too much going on in this photo for a cover. I think I am going to use the first photo. The second photo requires a large payment which the “owners” are unwilling to let go.